GA: Trump-endorsed Brian Kemp easily won his runoff against Casey Cagle, setting up a huge general election clash against Democrat Stacey Abrams. 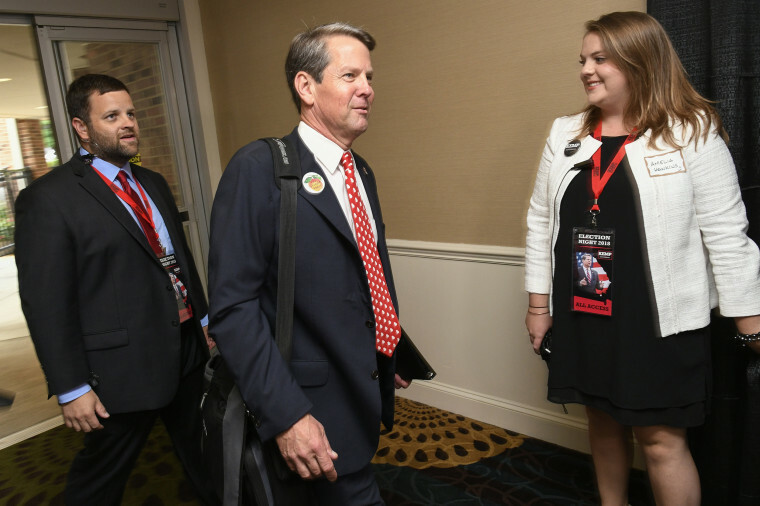 The Atlanta Journal-Constitution looks at how Cagle collapsed late in the race. Gun control activist Lucy McBath will take on Karen Handel. CA-GOV: John Cox and Gavin Newsom are debating over debates. CO-GOV: The New York Times had a big look yesterday at the baggage Walker Stapleton is carrying because of his great-grandfather's racist past. ND-SEN: From NBC's Ali Vitali: "The competitive North Dakota senate race has garnered a lot of national attention, but Senator Heidi Heitkamp's latest ad focuses on local issues. The ad, titled "Casselton" and released first to NBC News, highlights Heitkamp's work to better train and protect first responders following a 2013 oil train derailment in Casselton, North Dakota." NV-SEN: Dean Heller is in a tough spot when it comes to his vote on the new SCOTUS nominee, writes POLITICO. OH-12: Would Danny O'Connor support Nancy Pelosi or not? He appeared to waffle last night. PA: Pennsylvania Democratic Rep. Conor Lamb is up big over Republican Rep. Keith Rothfus. WV-SEN: Joe Manchin has no problem with Don Blankenship's attempt at a third-party run, writes NBC's Ben Kamisar. 2020: Is Kirsten Gillibrand prepping for a 2020 run? The New York Times takes a look. Cohen lawyer Lanny Davis released an audiotape last night of Cohen and Trump discussing payments involving ex-Playmate Karen McDougal. ICE is using tougher tactics under Trump. Trump is criticizing the FCC for moving to block the Sinclair-Tribune merger. Mick Mulvaney has emerged as a top contender to replace John Kelly, POLITICO reports. Senators will grill Mike Pompeo on the Hill today. Critics — including a lot of Republicans — aren't happy with the White House's plan to give farmers $12 billion in aid to offset damage from Trump's tariffs. The New York Times notes that Trump was not happy when one of the TVs on Air Force One was tuned to CNN rather than Fox. The administration is changing its tune on stabilization payments to health insurers.